– Evgeny, do you remember how did you start commenting games live? – It is already hard to recall. I guess it started in 2010, when the President of Turkish Chess Federation invited me to comment on games as a journalist. Two years later Turkey hosted a Chess Olympiad. 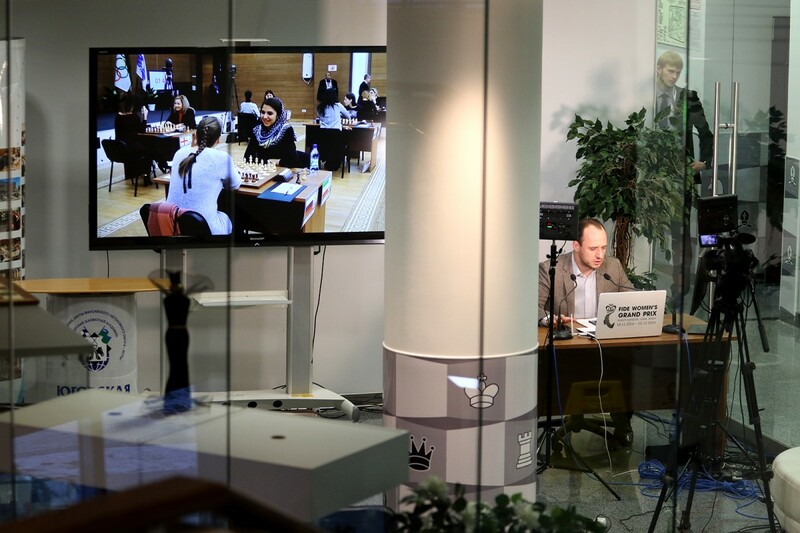 I arrived to do the usual chess expert stuff, and ran into my friend Mark Glukhovsky, who asked me immediately: “Are you aware you are commenting here?” – “Of course.” – “And are you aware you are commenting live on air?” That was my first time. I was totally frightened and really scared of a microphone. The first day was especially interesting, as I realized only too well how many people will be listening. I prepared some notes, about a page and a half, read everything out in about 15 seconds, and then nearly collapsed. – It was really scary. But then some people who listened to the broadcast told me it wasn’t as horrible as I thought. When you see the work of Peter Svidler and Jan Gustafsson, you immediately recognize a high quality show. I was always worried about my shows – how do I look, how good is my English, how well do I analyze the games, and so on. – What are the most important qualities of a live commentator? – All grandmasters commenting games live make the same mistake – they dig too deeply. Unfortunately, we cannot afford it. We want to go deep, but our goal is to broaden the audience, and talking about beautiful but lengthy lines is just silly – not too many people can follow. If you have like 10 or 20 thousand viewers, you want to keep it simple. The ideal format is a combination of a grandmaster and a strong amateur. We tested it a couple of times with Dirk Jan ten Geuzendam, chief editor of New in Chess. I analyze games, and he gives those down-to-earth remarks, like “Why do you think the bishop pair is good in this position? – In Khanty-Mansiysk you work alone. How hard is it? – For me it’s really hard. When I look at Sergey Shipov, it doesn’t seem particularly hard for him, he is always involved in a dialogue with the audience, which is sometimes real, and sometimes fictional. But I guess if I sit down next to Peter Svidler, I will feel uncomfortable even suggesting moves. – Who do you prefer to work with? – I think we made an excellent duo with Emil Sutovsky, because we never could agree on anything and were constantly debating with each other. Maybe it looked silly, but it was also very entertaining – the never-ending tension. 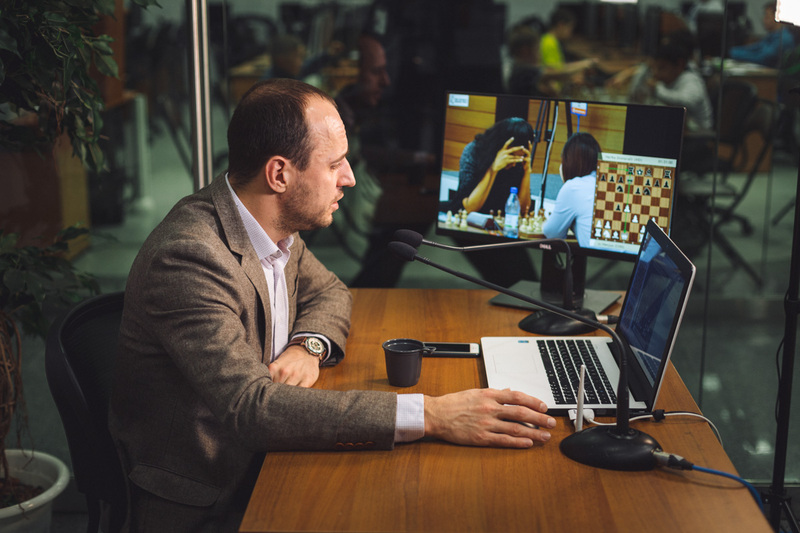 – Do you have any non-chess experience as a commentator? – Unfortunately, not. I could really step in in some sports. For instance, I could do many different kinds of pool. I had a chance to comment on chess boxing once, but it did not work out. Also, I was supposed to concentrate on the chess part, so that doesn’t really count. – Do you like the way your voice sounds on air? – When I recorded my voice for the first time many years ago, it was a genuine shock. By now I got used to it, though. – What was the most difficult moment in you commentator’s career? – Not sure if it was the most difficult, but easily the most unexpected one: Ilham Aliyev, President of Azerbaijan, came to the commentary booth at the Chess Olympiad in Baku. Normally the VIP guests just stop by for a few seconds and leave, and he actually shook hands with me and answered a few questions in very good English. For some reason I got really nervous despite already being quite experienced with the job. Cannot recall any episodes when I really screwed things up. – Any funny stories about technical problems? – Two events immediately come to mind: the European Club Cup in Eilat, in 2013 I guess, and Shamkir two years later. In Israel they decided to use a wireless connection to transmit the moves from the boards, but the network went down, so for the first ten minutes I had to use the footage: “It seems Adams is winning! No, not really – now I can see a rook behind the opponent’s pieces…”, etc. And in Shamkir the magic box went off, depriving me of diagrams, analysis board, and video footage. For the next 40 minutes while they were fixing it, I could only talk about very abstract stuff. – Do you only comment in English? – Yes, ever since that Olympiad in Istambul. It’s really funny that I have never commented chess live in Russian, the language I believe I can speak a little. – You don’t use analytical engines on air, is this a matter of principle? 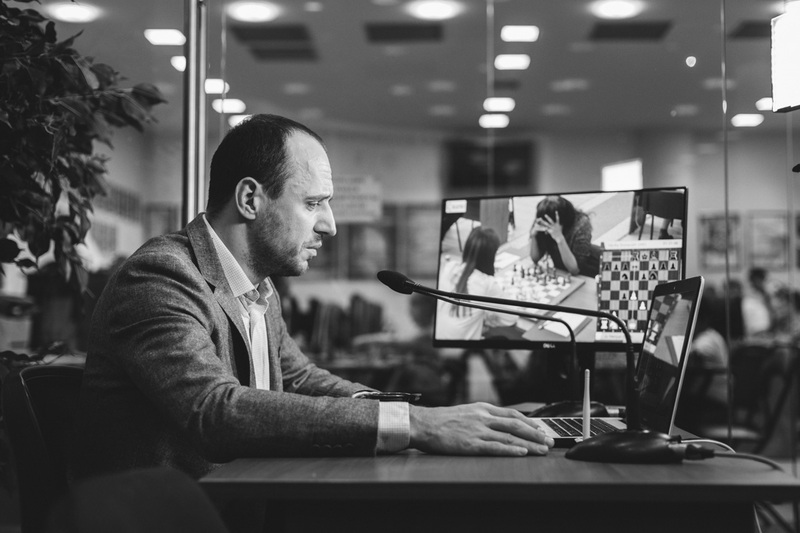 – This was the initial idea – to present an opinion of a grandmaster who is not influenced by the computer. Sort of to imitate the thought process of a player. Therefore, I try to avoid using engines, barring extremely complex critical positions by the end of a show. It may be an interesting idea to introduce a third party to chess streams – a computer-savvy guy who will join occasionally and enlighten us with definite conclusions of a supercomputer. 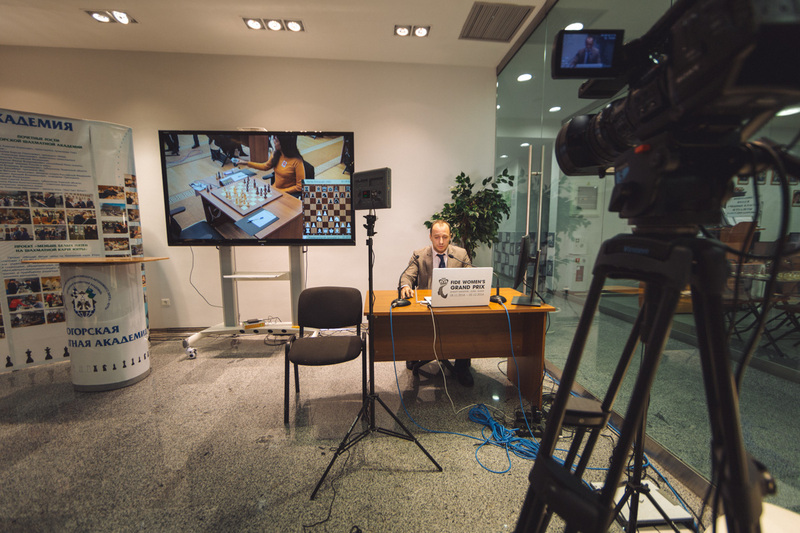 – How can we make live chess shows more exciting? – By introducing more interaction with the audience. I like the model of Chess24, who have a moderated chat and answer questions on air. Also, it makes sense to focus the camera on commentators more, as they often act very emotionally, which also draws attention. One of the biggest differences between chess and other televised sports is that we have everything in a less condensed way. So, the ideal live show should probably contain a lot of side stories. This should be like a reality show, then people will watch it! – You came to Khanty-Mansiysk not only as a commentator, but also as a trainer of the young Iranian player. Do you manage to remain objective and calm while commenting on her games? – Sometimes I feel frustration when she makes wrong moves. Sometimes I panic – oh no, she stands worse, she will lose… Well, what can I say – this is not an easy task! However, coaching women is not an easy task by itself. – How often do you work from Khanty-Mansiysk? – Fairly often. I think I was here in every role possible. In 2005 I played in the World Cup. In 2011 came as a coach of a player from Turkey. After that I came a few times to comment games live. I like it here – everything is predictable in a good way. When you mention Khanty in a chess company, everybody immediately understands what are you talking about. It is a small town where you can fully concentrate on chess, which makes it different from major cities. – What do you think about the 5th leg of the Women’s Grand Prix as a spectator? – It develops in a very unusual way for a women’s tournament. Eight rounds in, absolutely nothing is clear! I don’t remember anything like this. And I am trying to keep my sanity, preparing one of the players and rooting for her with all my heart, while pretending to be objective in the booth.